The forest industry can no longer assume the huge workforces it has been used to in the past are still going to be there when it needs them. It now needs to capture the hearts and minds of its future workforce—in short, it needs to be considered a ‘cool’ and lucrative career choice. 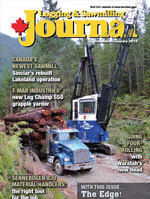 Don Banasky, president of the Truck Loggers Association and vice-president of operations at fast-growing Tamihi Logging, is a champion of safety in B.C.’s coastal forest industry. Saskatchewan’s L & M Wood Products is winning the employee training battle, with a program that was actually designed for training people on the manufacturing line in World War II. B.C.’s Tolko Industries has been trying out the GP grapple processor head, produced by Pierce Pacific, and after six months the multi-purpose GP head has been able to prove its stuff successfully in two different types of trials in the B.C. Interior. Canada’s newest sawmill revs upLakeland Mills’ newly completed sawmill in Prince George, B.C., is like no other sawmill built before it in terms of production, employing the very latest technology to attain the maximum recovery and value from its available wood fibre—but with a very strong focus on safety. Included in The Edge, Canada’s leading publication on research in the forest industry, are stories from the Canadian Wood Fibre Centre, Alberta Innovates - Bio Solutions and FPInnovations. Working with its industry-leading design expertise—and with an industry heritage reaching back decades—T-Mar Industries recently introduced the Log Champ 550, its new steep slope grapple yarder designed to take on the increasing volumes of second-growth timber in B.C. Waratah’s new 622C 4x4 multi-tree processing head with four roller drive is getting solid praise from the folks at McNeil and Sons Logging in the B.C. Interior, where it makes for a solid harvesting combo with a John Deere 2154D carrier. The Canadian forest sector is more than ready to accelerate the implementation of technological solutions that will make forest jobs more satisfying, secure and efficient. This would make it easier for the industry to attract crucially needed qualified workers, as it’s estimated that Canada will require some 60,000 forest workers by 2020. On top of supporting the development of many solutions in collaboration with its members, FPInnovations is organizing a key event this April to bring together experts on innovative technologies from around the world to Montreal to meet with representatives from the Canadian forest sector. “Robotics, automation, telematics and autonomous vehicles—you really will be able to have a look at the possible future of forestry machines,” says Jean-François Gingras, conference director and Harvesting Systems Research Manager, FPInnovations. 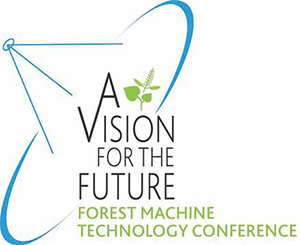 The first Forest Machine Technology Conference (FMTC) being held April 21 to 23 will indeed showcase advanced technologies that might soon be found in a forest near you. The FMTC will bring together stakeholders from the forest industry and other industrial sectors to define the challenges of using advanced technologies in the forest, present the technological potential in other sectors and encourage new partnerships as well as initiatives in R&D. “When we think of robots working in the forest, we may imagine a science fiction movie. Yet it is a possibility that is seriously being considered,” stated Pierre Lapointe, President and Chief Executive Officer of FPInnovations. “As the forest industry develops, it becomes absolutely necessary to think about what advanced technologies might offer the forest industry in terms of productivity and sustainability,” added Lapointe. Conference participants will have the opportunity to listen to forest industry leaders from Canada and Brazil, major manufacturers of international forest machinery and keynote experts from the mining and agricultural sectors. The FMTC will also feature technical presentations on advanced technologies, booths of various advanced technology providers, ideation working groups and presentations of technical and scientific posters. The FMTC is intended for managers of companies in the forest industry, equipment manufacturers, supply chain managers, technology providers in the forest sector and other sectors, members and partners of Unmanned Systems Canada as well as universities and R&D institutions interested in shaping a vision for the future. A member of Alberta’s governing Conservative party recently introduced a private member’s bill in the provincial legislature that would allow builders to construct six-storey wood buildings throughout Alberta—30 percent higher than the current four-storey limit. This follows the City of Calgary’s decision to allow all-wood, mid-rise building construction up to six storeys. British Columbia and Quebec already allow mid-rise wood construction up to six-storeys. Ontario joined them on January 1, 2015. Political action like this—to allow more wood use in taller all-wood or wood hybrid buildings either for residential or commercial/industrial use—is good news for the Canadian forest industry, says Steve Price, of Alberta Innovates Bio Solutions (AI Bio). Furthermore, the National Building Code of Canada (NBCC) is likely to accept six-storey, all-wood construction within its “permitted” solutions category when the 2015 edition is released. Many of these taller buildings will feature new wooden support structures like cross-laminated timber (CLT) instead of concrete or steel. CLT can be engineered for use in building construction as support beams, walls or floors and has strength properties comparable to other non-wood building products. It was first produced commercially in Europe about 15 years ago. Researchers in the Network on Engineered Wood-based Building Systems (NEWBuildS) have been leading the development of technical performance standards for CLT in Canada. The most economical uses for CLT are for wall panels but it can also be used in floor construction, says Dr. Y.H. Chui, scientific director for NEWBuildS. From the production standpoint, there is an evolving business opportunity for solid wood producers to attach CLT production plants to existing facilities like sawmills. Some companies have already done so, as over the past decade two commercial CLT production facilities have already been built in Canada. NEWBuildS and FPInnovations have done the technical groundwork needed by industry to guarantee CLT’s engineered performance when using Canadian wood species. “We have models that predict how strong CLT is, based on the lumber properties,” says Chui. AI Bio is an ongoing funder of the NEWBuildS network. Price, AI Bio’s executive director for bioindustrial innovation, agrees with Dr. Chui that if the trend toward greater CLT use continues, Alberta’s solid wood manufacturers should consider capitalizing on it with investments in CLT production, but they should first concentrate on developing the sorting capability to capture the high-quality wood fibre needed to engineer this type of product. Price adds that while other jurisdictions have been reducing the constraints for wood use in taller building construction, Alberta has experienced the opposite trend because of negative public perception resulting from recent large building fires, largely during construction. “We felt that our support of networks like NEWBuildS would assist in Alberta overcoming some of the constraints that were being considered, and we wanted to overcome those constraints through the transfer of knowledge resulting from good, sound research,” says Price. However, he says, more work needs to be done with provincial and municipal building and fire inspectors to better inform them about the fire and durability performance of wooden building components like CLT, based on the work conducted by NEWBuildS and especially when paired with an adequate sprinkler system. AI Bio recently co-sponsored a seminar hosted by NEWBuildS at the University of Alberta that discussed the technical specifications for a conceptual 20-storey, virtually all-wood building, with concrete use only for the floors and steel in some internal support structures. Speaking to an audience of wood product manufacturers, designers and architects at the seminar, Dr. Chui said: “I’m quite confident that we are going to see a tall wood building somewhere in Canada in the next few years.” CLT is proposed as the main support structure for this building. The introduction of the National Building Code of Canada in the 1940s limited wood construction to four storeys because of fire safety and wood durability concerns. 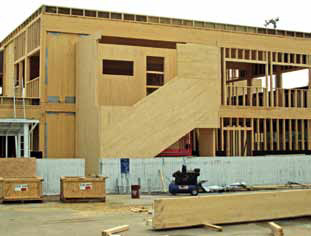 But through research conducted by NEWBuildS, FPInnovations, and a vast network of technical experts working together across Canada on the performance of wood buildings taller than four storeys—as well as the introduction of new structural wood products like CLT—greater wood use in mid-rise construction is making a comeback. The trend now is to adopt a more performance-based approach in the building code, which provides solutions addressing the arguments against greater use of wood in taller building construction. Engineered wood products like cross laminated timbers are becoming more prevalent as an alternative to steel and concrete in mid-rise building construction in Canada. For more information about AI Bio support for the NEWBuildS network, contact Steve Price at (780) 427-2567 or steve.price@albertainnovates.ca. Whenever we walk into a museum, the office, the kids’ school or the shopping mall, most of us unknowingly benefit from the work of thousands of experts that design and enforce practices and obligations that make these places safe. The construction sector refers to these rules as building codes. As the world changes, new technologies are developed, processes are refined and markets shift their priorities, and building codes must constantly be adapted and improved. While benefitting the population, these changes can mean big challenges for the industries involved. The wood products industry is no exception. With the building codes in Canada, the U.S. and other jurisdictions, the wood products industry needs to ensure that its products now meet higher energy-saving requirements than before. The new requirements, however, represent significant technical, economic and competitive challenges. Putting its science in service to support the industry, FPInnovations’ research team is already making important headway in this direction. In fact, FPInnovations’ latest report on Development of Multi-Functional Wood Composite Panel Products for Next Generation Building Systems offers some encouraging news, highlighting promising progress with prototype sandwich design panels. Earlier project work looked at what products were available, including plywood and OSB, which products could be combined and how to combine them, how they would work and potential problems. The multi-functional panels require a host of key performance attributes: structural strength; thermal insulation; moisture control, including wall cavity ventilation; effective attachment to the wood frame; and effective attachment for exterior cladding. The latest work evaluated prototype panels made with OSB faces and two types of rigid insulation core, dry process wood fibre insulation or extruded polystyrene foam (XPS). It focused on how the multi-functional panels performed: the connection to a wood structure frame, the connection of exterior cladding to the panels, and the lateral load resistance of a wood frame wall construction sheathed with these panels. Simulations of the panels’ thermal and moisture control performance in a typical wood wall construction were also conducted. The simulations suggest that multi-functional panels made with OSB or plywood faces can perform well in even the coldest climates. The next steps are now well underway. FPInnovations has already completed fabrication of the full-size panels. In November, FPInnovations began working with the Alberta Innovates Technology Futures team in Edmonton to construct the first demonstration building. An identical structure will then be built in Vancouver. From there, instrumentation will be installed, followed by the finishing touches (exterior cladding, gypsum board, paint, etc.). FPInnovations will also carry out structural testing on additional full-size panels at its Advanced Building Systems testing facility in Vancouver. For more information, contact Bob Knudson at (604) 222-5738 or bob.knudson@fpinnovations.ca. In the FPInnovations treasure chest of innovations, ideas and tools, there are many jewels to be discovered. One of them is a comprehensive forest machine productivity database. It was created and has since been meticulously taken care of by the Harvesting Operations research team in collaboration with hundreds of people in the forest sector. Field measurements taken over the last several decades date as far back as 1975. Thousands of entries and data points describe performance characteristics of specific forest equipment. Some of these machines are, of course, now closer to belonging in a museum instead of working their way through thick black spruce forests. Nevertheless, the vast chunk of this mountain of information realistically describes the productivity potential of all the popular machine technology that has navigated through Canada’s forests from coast to coast in the last four decades. FPInnovations aims to help its member organizations increase the efficiency of their operations and develop cost-effective practices, from making the best possible use of forest fibre to efficiently and safely delivering products to end users. From felling, delimbing and bucking to skidding and forwarding, FPInnovations’ research teams have gathered precious productivity data for every step of the logging operation and its many variants. A wide variety of conditions has also been observed in terms of types of soil, steepness of terrain, season, types of settlement and regeneration dynamic. Also, and most importantly, the productivity of forest machinery was observed and measured for a range of harvesting practices. FPInnovations has been in a position to achieve this goal by drawing on its comprehensive forest machine productivity database, and forest companies that are members of FPInnovations are benefiting from it. Tools such as FPInterface, FPInterface Express, Provue and the Fuel Economy Guide are just a few of the many examples of applications that stem from this mountain of data. They all base their core algorithms on real data. This helps companies make better informed decisions. Moreover, tools from the FPSuite operational platform—FPDat, FPCom and FPTrak—also allow data to be collected from the field in order to support industrial companies in making better management decisions. 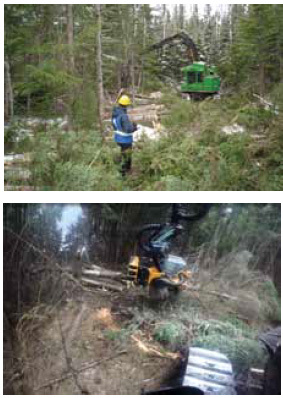 The FPInterface software platform was initially designed to simulate forestry operations: route building and maintenance, harvesting, silviculture, biomass and transportation. Today, with the latest version of FPInterface, users can carry out analyses on potential scenarios that could lead to optimizations in specific forest operations activities. Designed as a user-friendly tool, FPInterface allows data visualization directly on the forestry map. In fact, all Canadian wood processing plants are now geo-referenced in FPInterface. FPInterface Express uses the same production equations as FPInterface, but provides the user with a simplified interface presented within a calculation spreadsheet, and without the cartographic aspect of its “big brother”. FPInterface Express is designed to compare simple cost scenarios between different machines or methods, rather than develop tactical or strategic analysis. The ProVue software allows questions to be asked directly to FPInnovations’ forest machine productivity database. The software helps forestry contractors choose the best harvesting system according to their operating conditions and harvesting practices. By entering their own data in ProVue, users see what they can expect in terms of productivity based on real world data. FPDat, an on-board tool designed to collect data on machine performance and productivity, is key to productive and efficient operations. It is a heavy-duty device and therefore capable of withstanding difficult conditions such as those in which forest, mining and farming equipment operate. It provides operators and managers with information on performance, areas treated and utilization rates. The data can be viewed and analyzed on the FPTrak web interface and downloaded to carry out personalized analyses. Though collaborative research programs, FPInnovations develops science to help the Canadian forest industry increase its efficiency, its capacity and, in turn, its competitiveness. As the saying goes, you can’t improve what you can’t measure. FPInnovations has measured the many parameters of forest machine productivity and still does, day in and day out. Only by relying on tools fed by real-world data will the sector be able to transform its culture and practices, and truly compete in today’s globalized market. The Canadian Wood Fibre Centre (CWFC) continues to refresh its research program. It has identified several opportunities where it can share its extensive knowledge in forest management practices with new partners working in a wider variety of landscapes, given so many examples of changing land use priorities and their potential impacts on Canada’ s commercial forest. Over several decades, CWFC and the Canadian Forest Service have accumulated extensive knowledge on afforestation, enhanced forest management practices, and production of high yield, short rotation woody crops. It is looking for new avenues to share this knowledge. This research refreshment at CWFC also reflects a growing concern within government and the forest industry about the amount of productive forest being lost every year from non-forestry related activities on the landscape. Derek Sidders, CWFC Prairie Regional Co-ordinator and Program Manager, says the organization is developing partnerships to address varying land use priorities with a focus on innovative reforestation to counteract the reduction or loss of productive forest disturbed by pests, pathogens or wildfire, sub-surface resource extraction or urban sprawl. They are also investigating impacts of forest management practices over the past four decades, what impact they are having on the mid- to long-term fibre supply, and how these managed sites could be enhanced by adopting additional forest management applications; and refining forest management practices to reduce risk to natural and introduced hazards. All of this is being done while supporting the expansion and transformation of the Canadian forest industry, looking specifically at the areas of bio-energy and specialty bio-products, as well as maintaining quality solid wood product and pulp feedstock. The question is how to establish that forest cover economically to counteract loss of forest land as a result of land fragmentation, whether from urban sprawl or industrial use. One obvious approach is land reclamation for disturbed forest sites, and CWFC wants to develop collaborations with industry in this regard, particularly with its knowledge of natural forest renewal and establishing short rotation woody crops. However, that alone may not be the only or the most economical approach. That’s where CWFC’s knowledge, experience, and approach can really make a difference. Sidders says establishing forest cover on parcels outside of areas where land or industrial development is occurring may be more economical from a reforestation standpoint, because in addition to the economics and ecological values, in some cases there are also scale and timing issues. Oil and gas companies, for example, often keep lease sites and roads open for decades despite inactivity on many of these sites, and many of these sites may be small and low value. Another area where CWFC believes it can play an important role is developing mitigation strategies to help Canada and the forest industry adapt to climate change, because it has the potential to have an adverse social impact, threaten the sustainable commercial fibre supply and upset the ecosystem balance particularly along the forest fringe. In keeping with CWFC’s mandate to contribute to the competitiveness of the Canadian forest industry, CWFC has also identified opportunities where it can work more closely with industry to establish fibre crops for specific end uses. “There are opportunities to adapt short rotation woody crops close to urban centres where there are specific feedstock requirements or fibre characteristics for an expanding industry, whether it be for specialty bio-products or conventional products,” says Sidders. The goal is to establish these feedstocks in appropriate locations to minimize transportation costs to give industry access to a very consistent feedstock source. For more information about these new initiatives at CWFC, contact Derek Sidders, CWFC Prairie Regional Coordinator and Program Manager at (780) 435-7355 or Derek.Sidders@NRCan-RNCan.gc.ca.